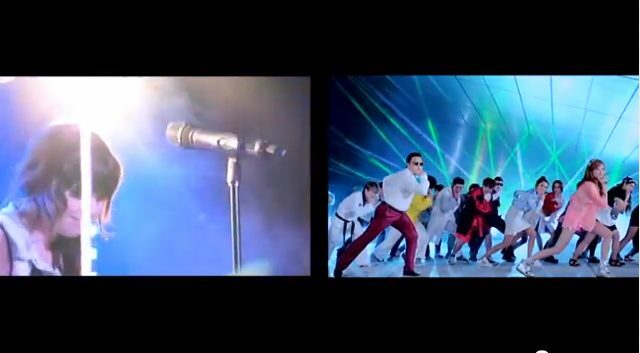 Psy's 'Gangnam Style' + Carly Rae Jepsen's 'Call Me Maybe' = MASHUP! Home / Livid Lobster / Psy’s ‘Gangnam Style’ + Carly Rae Jepsen’s ‘Call Me Maybe’ = MASHUP! Psy’s ‘Gangnam Style’ + Carly Rae Jepsen’s ‘Call Me Maybe’ = MASHUP! September 25, 2012 By John P.
Well, we had a little extra time on our hands at the Livid Lobster factory, so we put together this mashup of the extremely popular videos Gangnam Style by Psy and Call Me Maybe by Carly Rae Jepsen. Links to the original videos can be found on our YouTube page here. Haha, it’s priceless to see two awful songs in one. OMG, what the hell, can you tell me what happens in the end, its not possible to see more than 2 minutes.